FLOWERSBLOOMS by "Elvie": A Coach from the Heart of MT !!! I wonder what's in this box ! 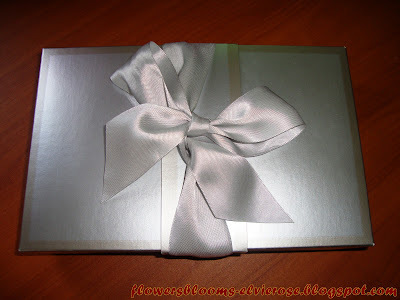 My great boss, Greg Reichow came to my cubicle yesterday and handed me a nice silver box with ribbon. He said it came from MT. Boss Greg recently came from our headquarter in San Jose, California, U.S.A. for the Operations Review with our CEO, Tom Werner last week and it was so kind of him to hand-carry the package from MT. MT is Maria Queri, the Executive Assistant of our COO, Marty Neese from SunPower Corporation U.S.A. Her name sounds like "Mariah Carey", the popular American pop/R&B singer-songwriter, record producer and actress. So, whenever I see the name of MT on e-mails, it reminds me of the famous singer "Mariah Carey." Wow ! A cute Coach scarf print wristlet !!! What's inside the silver box ? 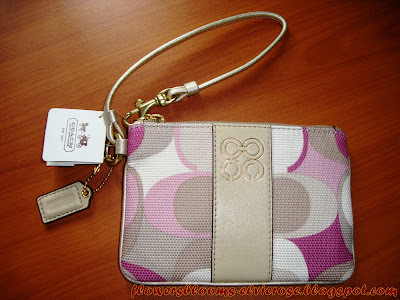 It is a cute Coach scarf print wristlet ! Wow, what an expensive item. This costs around USD 50 - 60 (Php 2,200-2600). 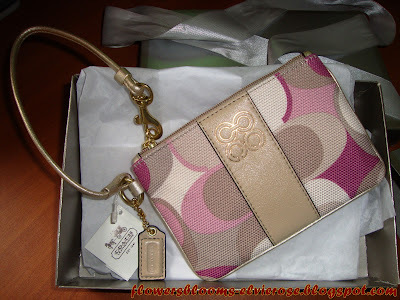 I love Coach but it is too expensive for me and I would rather spend for the basic needs. I can only afford the imitation one which can be found in the bags/wallet section in Greenhills, Metro Manila. Thank you MT for this beautiful wristlet ! MT is a Filipina and I have not met her personally but I am looking forward to meeting her. I hope I will have the opportunity in the future ! To Maria Queri ("MT") : Thank you for your thoughtfulness and generosity ! May God take care of you always and shower you with wonderful blessings ! Wristlets are extremely beautiful and functional ! Coach purses and wristlets are all about the style and details. These pouches are extremely beautiful and dream of all wristlet loving girls and young women. Finest materials, styling and detailing make it look awesome. One of the most important characteristics of the wristlet is the top-notch quality canvas and leather Coach Company is using. As a result, these fashion accessories have become very fashionable. Coach wristlets are known for their color range, hardware and distinctive shapes. Coach Company designs pretty and stylish wristlets both for formal and casual wear. Coach wristlet is designed to be used as a handbag or as an envelope wallet. This is because it has a detachable shoulder strap that hooks on the sides. So, not only is it beautiful but functional as well. Coach wristlets are not large, but they have enough space for a lot of things, like lipstick, mascara, I.D., drivers' license, iPod etc. Coach is a leading American designer and maker of luxury lifestyle handbags and accessories. Coach’s slogan, “The best quality offered under the best possible price,” represents two of the three key elements of Coach Brand identity. Thanks Steve for your comment ! Please to meet you as well !